Thanks to everyone from the Waukesha County Reading Council who attended Help Readers Love Reading today. I hope everyone was introduced to a new book or two (or more!) that you can't wait to take back to your students. Hopefully you took away some new ideas about how to use them as well. A special thank you goes to Colleen for inviting me to Waukesha to speak with you today and for taking care of all the planning. Thanks! If you have any questions you didn't get a chance to ask, additional thoughts or comments, or anything else you'd like to share, leave a comment below this post or send me an email. I'd love to hear from you. Thanks again for attending this morning's meeting, and thanks to everyone for all you do to Help Readers Love Reading! UPDATE: Many of you mentioned a desire for more books geared at middle school and high school. All the reviews on the site are organized by grade level. Try here: Grade 6-8 and here: Grade Young Adult. Hopefully you will find more of what you are looking for. I've got plenty of books on the site for those age ranges, but for some reason they didn't make it into the presentation. Thanks for the suggestion. Found: One sticky note containing the following message: "Tottally good/awesome! I really liked The Puzzling World of Winston Breen." Location: Attached to the cover of my copy of the book. Allow me, for just a moment, a little soapbox standing. "Eh-hem. If you find a sticky note written by a child, similar to the one listed above, read the book. Thank the child repeatedly. Don't mention any spelling errors." Thank you. Now as the book itself, here's my review: ""Tottally good/awesome! 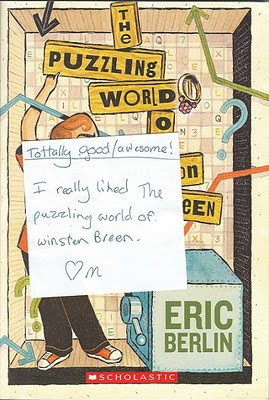 I really liked The Puzzling World of Winston Breen." 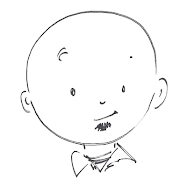 Winston is a kid who loves solving puzzles and sees them everywhere. Anagrams, patterns, numbers, word problems, pictures, you name it. Winston loves it. He finds them, solves them, and creates them. In the first chapter Winston gives his sister, Katie, a carved wooden box for her birthday. When Katie finds a hidden compartment containing four thin strips of wood with words on them, nobody believes that Winston, puzzle-man extraordinaire, isn’t behind it. Everyone thinks he planted them there. He didn’t. He’s just as surprised as everyone else. The four wooden pieces end up being part of a larger set of sixteen. Put together, these sixteen pieces lead to a treasure left in the will of a very rich, local inventor. His four children could never work together, and the pieces eventually end up separated. Winston is drawn into the treasure hunt by the only remaining child, Violet Lewis, and two suspicious treasure hunters. Each person owns four of the pieces. 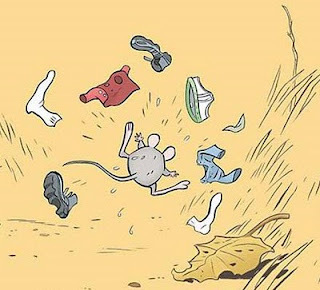 Each wants to find the treasure for different reasons. Two want the treasure. Violet Lewis wants to end her father’s mystery. Winston wants to solve the puzzle. The book is filled with puzzles, and a website is given that contains all of them ready to print out, cut up, or write on. Some are answered within the story’s text, usually those that matter to the plot. Some puzzles are simply for the reader. Their solutions don’t matter to the story, only to Winston’s character development and the reader’s enjoyment. The only problem is that the story is so engaging, readers may find it difficult to stop reading to solve the puzzles! Eric Berlin, a puzzle maker himself, has created a children’s book that will engage kids who enjoy puzzles and mysteries. Most readers will be able to solve a number of the puzzles and come away with the feeling that they helped Winston solve the biggest puzzle of his life. Mercy Watson hits a pig and butter bonanza when Mr. and Mrs. Watson decide to take the family to the Bijou to see When Pigs Fly. Even though Mercy’s favorite food is toast with a great deal of butter on it, the Bijou offers real butter on their buckets of popcorn, and those buckets are bottomless. Predictably, neighbors Baby and Eugenia Lincoln climb in the backseat, followed closely by neighborhood children Frank and Stella. Some familiar characters are already at the drive-in. Officer Tomilello is in attendance with his wife and former burglar Leroy Ninker is now a reformed thief and cowboy-in-training, gainfully employed selling bottomless buckets of real-buttered popcorn. With a familiar cast of characters now set, the now familiar chaos that follows Mercy Watson arrives as well. Mr. Watson and Frank leave to get popcorn, but Mercy, the scent of butter in the air, leaves to investigate on her own. Finding a large bucket of popcorn in the hands of a little girl, she helps herself. The young girl’s buttery scream of distress draws the attention of Officer Tomilello, cowboy-in-training Leroy Ninker, and Animal Control Officer Francine Poulet, who is also in attendance. 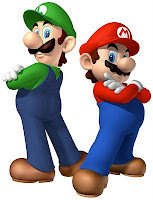 Soon readers’ favorite firefighters, Ned and Lorenzo, are called. Mercy chases more popcorn. Everyone else chases Mercy. The chaos at the drive-in is absolutely thrilling to Mercy who always has loved a good chase. Finally, as they have in previous Mercy Watson stories, Ned and Lorenzo save the day, and everyone enjoys some hot buttered toast. 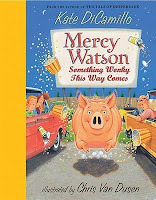 Readers can expect to enjoy Something Wonky This Way Comes as much as Kate DiCamillo’s other Mercy Watson books. Probably as much as Mercy enjoys hot toast with a great deal of butter on it. A. The furnace reacting to the -4 degree overnight low. B. An early morning visitor in a Model T.
C. An elephant clogging the laundry chute. No matter what the cause, when you have a tool belt like Chico Bon Bon, you can handle it. But finding the noisy problem can prove to be more difficult than solving the noisy problem. Where could it be? The bread box? The hamper? Under the floor boards? No, it was none of those. What could cause it? A tricky family of woodpeckers? A lumberjack? Bats, monsters, or squirrels? Again, none of those. Believe it or not, there truly is an elephant clogging Chico Bon Bon’s laundry chute. An elephant named Clark. Clark thought he was visiting his Elsa’s house, but Elsa lives two doors down. The next thing he knew, WHAM! Stuck in the laundry chute. Thankfully, Chico Bon Bon is one resourceful monkey. A monkey with a tool belt. And tool belts have everything needed for solving problems. A chipper, a chopper, a bopper, a bipper. A tacker, a clacker, a snicker-snacker. A paper scraper, a glitter vac, a putty splapper, a tail clamp. And numerous others, especially those used to laundry de-chute an elephant. 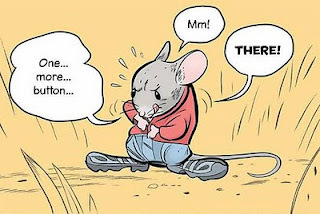 Kids will once again enjoy Chico Bon Bon’s adventure, even though this one doesn’t even take him out of his house. 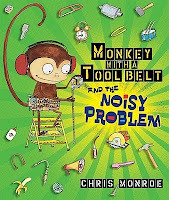 Author Chris Monroe has created a monkey who is thoughtful, thorough, and creative problem solver, and who proves to be a great friend.